No device is safe from the perils of malicious software, and Google’s Android, being an open source and ubiquitous piece of firmware, is particularly susceptible. As such, it’s important for Droidsters to arm themselves against the hackers looking to scrape their data and use it to unscrupulous ends. What’s even more alarming, however, is that many seemingly legitimate apps are collecting info on us, often without our knowing, and you find this fact to be more than a little disconcerting, then a nifty little firewall app for Android will help you regain control of the data you share. As soon as you connect to a cellular or Wi-Fi network, many apps get to work on logging your data, and although there are systems in place that notify you of what kinds of access an app may require, a lot of less transparent apps carry out this monitoring behavior on-the-sly. To add insult to injury, even if a particular app is found to be collecting information on you without explicit consent, there’s often no way of stopping it from doing so without deleting it entirely, which seems a fairly drastic measure, particularly if you happen to use this utility on a regular basis. Even though this covert behavior may anger you, there’s no need to go gung-ho and remove all remnants of the offending app from your home screen. Instead, NoRoot Firewall will keep tabs on all connections, ensuring that the innocent-looking camera lens app isn’t collecting data on where you take your pictures, or making certain that your e-reader isn’t throwing you into its sample for a survey on bookworms. 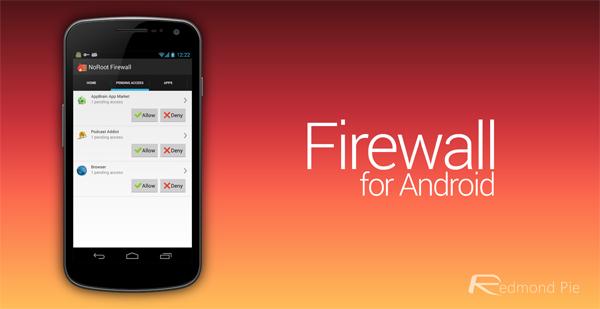 The Android NoRoot Firewall, as you may have surmised, doesn’t require root access, which is a rarity in this field. 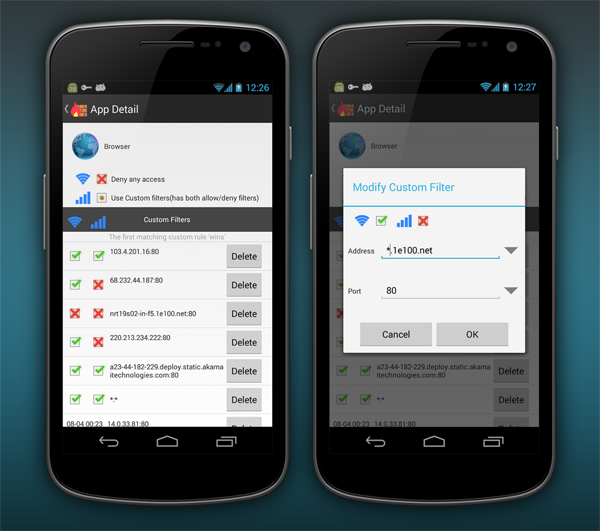 Often, root access is required to get into the depths of Android, ensuring maximum effectiveness. But the NoRoot Firewall does its job without root access, allowing you to block apps you don’t want connecting to the Internet. It’s free of charge, so you’ve nothing to lose by installing it and testing it out, and although its not yet optimized for LTE (and thus, LTE users should proceed with caution), the developer has noted that an update should fix this issue in due course. This is no where near a firewall and in fact is an added security risk. Not only can the app itself be used to get to your information but if a user is unaware of the malice of a program and lets it through it doesn’t help anyway. And lets face it most malware out there isn’t recogniced by the user. In fact and the comments made confirm that, users are just hunting for apps that use most bandwidth and restrict those. Last but not least try for fun sake setting up a server and connect from the outside. You will see having an app thats sitting there sweet and quitly till a connection is made from outside is completely ignored as the connection will bypass the vpn.